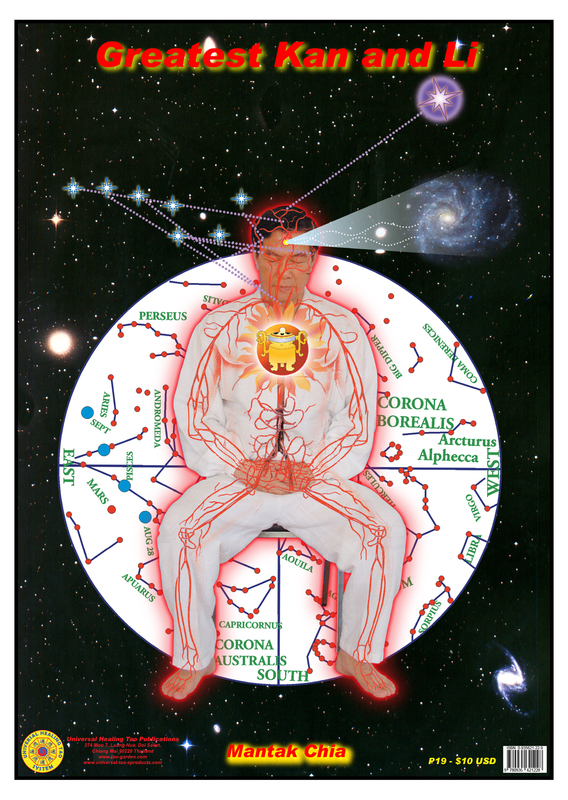 This poster illustrates Master Chia in a Sitting Posture opening the Compassionate Heart with the Cauldron steaming the Lymphatic System, opening the Crown with the Seven Stars of Big Dipper with the Four Consolations as a background. The final portion of the Kan and Li practice is the Greatest Kan and Li. The substance of the Greatest Kan and Li practice is the formation of the container or cauldron at the Heart Center. This is the Middle Tan Tien or Cinnabar Palace, an additional cultivation of the soul and spirit. The Heart Center is the location where most of the Greatest Kan and Li practices occur. The pairing of the vitalities here, particularly those involving macrocosmic-microcosmic aspects, is the primary formula necessary for the enlightenment of individuals. This enlightenment, when attained, takes an individual to a stage of Taoist Immortality.